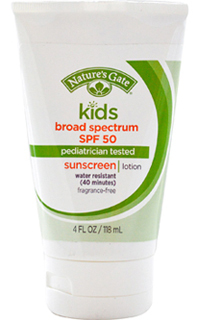 By ‘natural’ sunscreen, I mean that the inactive ingredient list contains (mostly) things everyone can pronounce and the main sun protection filters are physical (such a zinc oxide or titanium dioxide), rather than chemical (such as oxybenzone, avobenzone, octisalate, octocrylene, homosalate and octinoxate). Without lecturing you too much, there are several studies about the potential toxicity of chemical blocks and to me it’s good to know there are alternatives that have been proven not to have any interaction with hormones. As a rule of thumb, I try not to put on my body anything I wouldn’t eat, and sunscreens are rather difficult. By default, physical (or mineral) blocks are a lot less comfortable than good old hormone disruptive Coppertone and Banana Boat, because they leave a white film on the skin (the actual block! ), but I did find some good (and some not so good) stuff in there that I wanted to share with you. This sunscreen’s name is quite misleading, as it contains several chemical blocks. It is quite thick and hard to spread, but once it’s rubbed in properly, it doesn’t leave any residue unlike other ones. It is free of fragrance, parabens, phthalates and oxybenzone and is also cruelty free and vegan. It’s the only sunscreen of the lot that I thought smelled nice despite the no perfume label: a kind of sunscreeny-beachy type of smell (possibly the chemical blocks?) The tube is really small and due to the thickness, a lot of product is required to apply, so it won’t last very long. Active Ingredients: octinoxate (yikes), octisalate (re-yikes), octocrylene (re-re-yikes), zinc oxide. The label for this reads “natural mineral zinc, petroleum free, coral reef safe, non-greasy, gmo and gluten free, vegan and goes on clear.” My first impression is that it does not at all go on clear, but it can appear like that on fair skin. Over my dark tattoos, I can clearly see the white film of zinc. 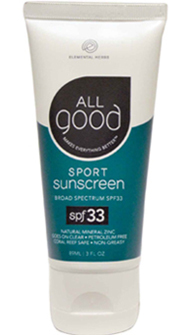 It’s non-greasy as advertised and it leaves my skin soft and powdery, unlike other sticky sunscreens discussed here. The smell reminds me of boiled pasta water?! There are great skin nurturing ingredients in here: grape seed oil, rose hip oil, jojoba, olive, etc. This one is not waterproof and definitely does not rub on well over hairy arms and legs (not talking of my own here). The tube is also quite small but the product is thinner, so a little goes a longer way. This sunscreen has the consistency of toothpaste and smells like play doh. Yet for some reason, I quite like it. It’s extremely water resistant and stays on your skin forever. I find myself not reapplying and never getting burned. The secret I guess is to apply with a very light hand, otherwise you end up with sticky ghostly skin. This sunscreen is also kind of on the thick side, but it does applies much easier than the Nature’s Gate one and the ingredient list is much simpler and shorter. Again, this is not so awesome for hairy arms and legs. I featured this one last year and repurchased it again this year because it was one of my favourite. The ingredient list is really not optimal and the labelling is rather misleading, but it is a gigantic tube of products and a little really goes a long way. It’s the most budget friendly option of the lot and as far as bad sunscreens go, there are a lot worse out there. It’s formulated without oxy­ben­zone, PABA, phtha­lates or fra­grances and I like that it is not per­fumed. I would however not use this on a baby. I was not able to get a hold my favourite Josie Maran face sunscreen this year, so I tried this one instead. It contains some less than ideal ingredients, but I have yet to find a completely mineral-based face sunscreen that doesn’t leave me looking like I’m trying to put a geisha makeup on. Some of the inactive ingredients sound frightening also. At least, it doesn’t break me up and protects my face from the sun, so that’s that. 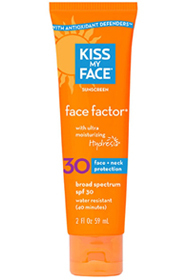 I wish there was better options for face sunscreen, I’d love to hear your suggestions. 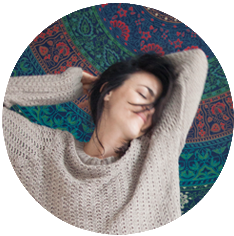 Are you new to iHerb? Use coupon code WEZ549 for up to $10.00 off your first order! That is a very cool round up, love your sunscreen tips. But lately it’s always raining here in Pattaya, Thailand. You know, I never really thought about checking into the sunscreen I wear. I’m actually just now getting into the habit of consistently using sunscreen. So, this is actually great information to learn! 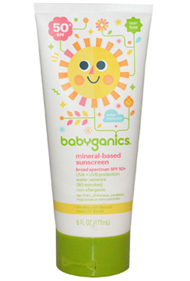 I want to try the Babyganics since it’s a higher SPF and it’s water resistant! Greta roundup. Didn’t know there are so many options in natural sunscreen. Love the babyganics one. I live in New Zealand so we’re bundling up on jumpers against the cold rather than slathering on the sunscreen, but since New Zealand is so close to the hole in the ozone sun protection is an important topic. There’s a saying here on how to keep safe – ‘slip, slop, slap, and wrap’ as in Slip on a shirt, Slop on the 30+ sunscreen, Slap on a hat, and Wrap on some sunglasses. 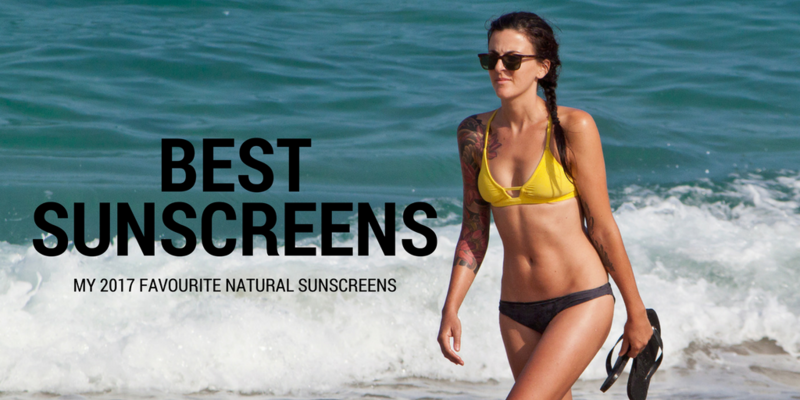 Really good round up on these sunscreens. I feel like one habit everyone should acquire is always put sunscreen. It is very important. 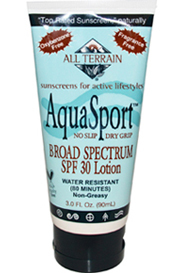 Good round up on sunscreens! Reminds me to buy one too! Thanks for the super useful post! A couple years ago I read a post about the toxic chemicals in virtually all the major sunscreens on the market. It was highly discouraging (and frustrating they can get away with it) This looks like a great list of quality, healthier alternatives. Book marked! thanks! It’s funny reading your post, as I live in Netherlands, which basically means, I almost never get to see the sun, hence I stopped using sunscreen since I moved here 2 years ago. While traveling, especially when you are off to places like beaches you need to be prepared with proper protection against the sun. The skin needs to be protected as it is the most sensitive part. Sunscreens are the answer here and your list is pretty useful step here. Good review on sunscreens. I never forget to wear one before I step out. It’s a must for travelers.